Michaelmas, the feast of Saint Michael the Archangel (also the Feast of Saints Michael, Gabriel, Uriel and Raphael, the Feast of the Archangels, or the Feast of Saint Michael and All Angels) is a day in the Western Christian calendar which occurs on 29 September. Because it falls near the equinox, it is associated in the northern hemisphere with the beginning of autumn and the shortening of days. 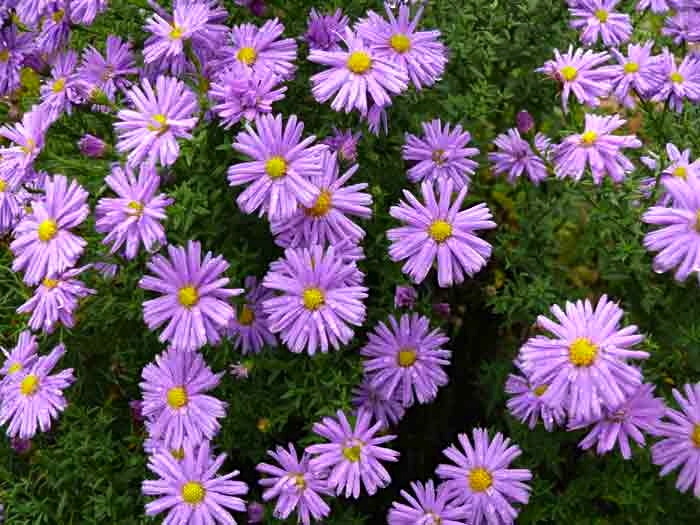 Michaelmas daisies, which are in full bloom around Michaelmas, come in a variety of colors, but the classic daisy is pinkish purple, as in the photo above. Aster amellus, the European Michaelmas Daisy, is a perennial herbaceous plant of the genus Aster, belonging to the Asteraceae family. This entry was posted on October 5, 2013 at 6:09 am and is filed under Holidays, Language and plants. You can follow any responses to this entry through the RSS 2.0 feed. You can leave a response, or trackback from your own site.